UMP | University of Minnesota Press Blog: With a little help: How crucial encounters with Werner Herzog and Mick Jagger led to the development of a screenplay about Robert Johnson's extraordinary life and legacy. With a little help: How crucial encounters with Werner Herzog and Mick Jagger led to the development of a screenplay about Robert Johnson's extraordinary life and legacy. It was 1974, and it all began when I was building a bed. Living alone at age twenty-three on New York’s West End Avenue, all my belongings were packed except for my portable record player and a single vinyl album I’d just bought. 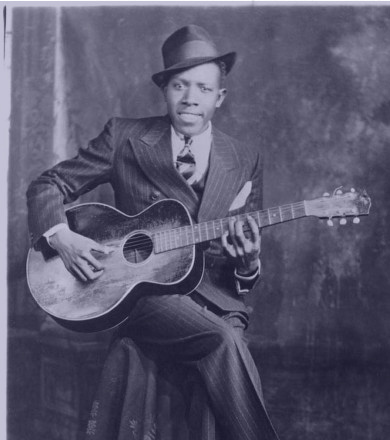 The LP was Columbia’s second volume of Robert Johnson’s twenty-nine recordings, its cover art a painted image of Robert in a converted hotel room studio, seated with guitar facing a microphone and the converging walls, the white recording engineers looking on. I set the stereo to “repeat,” and for several hours of sawing wood and hammering nails the music of Robert Johnson entered my bloodstream. Songs like “Love In Vain” and “Stop Breaking Down” were resonant from unknown realms to the depths of my soul, and soon changed my life. In my naivete I called the legendary head of Columbia Records, John Hammond Sr., and unexpectedly the great man answered the phone himself. He affirmed his enthusiasm for the idea and offered his help. Shortly thereafter he was dead. Two years passed. I’d worked for Paramount Pictures and quit to find work in pursuit of real cinema. And to woo my future wife, an American who danced ballet at a theater in Munich. I lived in Munich and worked with Werner Herzog on several films, all the while transfixed by the idea of writing a screenplay that came to be known as Love in Vain. The night before I left for the States to start my research, Werner and I stayed up very late discussing my vision of Robert Johnson and the eventual screenplay. We agreed that Robert Johnson represented the Real Danger in his culture and ours. He was aggressively audacious in challenging the Baptist Church and Christian life while singing of Satan in our midst. Werner and I pondered this until we agreed upon a more recent African-American singer whose looks and music were unrelated to Robert but who possessed that menace, that audacity, that defiance of all things racist (and homophobic), and settled on Little Richard. A day later at 7 a.m. I sat alone on a bench in the desolate Brussels train depot, listening to the silence. Then, the clickety-clack of high-heeled shoes broke the stillness; completely alone, hair coiffed and wearing a gold lamé jumpsuit with a lavender satin cape, red spiked heels glittering, was Little Richard. When he cruised me I told him what I was up to and mentioned the previous night’s conversation back in Munich. He asked me if I wanted to have some fun. “More than you can imagine,” I cheerfully replied. A year thereafter I moved to the downtown West Village in New York City to write Love in Vain. Having no funds to sustain myself for the effort, I thought of people whose work and public statements suggested a rich appreciation of Robert Johnson, and a possible interest in lending financial support to my film project. I quickly settled on Mick Jagger, whose nonpareil interpretation of “Love in Vain” suffused me when I was hammering that bed. In order to reach Jagger I conjured the idea of leaving a note and story synopsis with his girlfriend Jerry Hall’s modeling agency. That night I was chatting with Jonathan Cott, senior editor of Rolling Stone magazine, and told him of my idea about Mick Jagger. Fervently he begged me to forget it. He had just conducted the Rolling Stone interview with Jagger; while telling me that Mick would be five days late for an appointment and upon finally showing up would be irate if Jonathan wasn’t still there, the telephone rang. I picked it up to hear a very familiar voice in person for the first time: Mick Jagger’s. He was laughing, he said, because when young Jerry handed him my note she insisted the part of Robert Johnson sounded perfect for Mick. Immediately I began meeting with Mick and together we began a production partnership that lasted three years. The first step was his funding of the screenplay draft. But the night before I was to begin writing, Mick and I had a productive meeting about the nature of the screenplay and its characters, and I had all of his support and confidence. Upon leaving, however, I looked Mick in the eye and declared, “This is going to be either the best screenplay ever written or the worst.” Big mistake. It would be two months or more before Mick and I would meet again, when the work was in progress without any financial backing from him as agreed upon. I sent him the screenplay’s first fifty pages, which reached him backstage while hosting Saturday Night Live. Within days our lawyers were talking and the odyssey to produce Love in Vain had at last commenced. Alan Greenberg worked on Martin Scorsese's Cape Fear, Bernardo Bertolucci's 1900, and with Werner Herzog on classic screenplays Fitzcarraldo, Cobra Verde, and Heart of Glass. 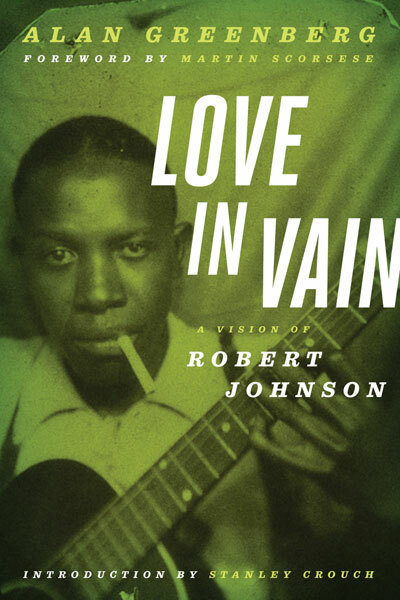 His screenplay Love in Vain: A Vision of Robert Johnson, which includes a foreword by Martin Scorsese, will be out from U of MN Press later this month. Please check back on our blog later this month as Greenberg continues the discussion of the making of Love in Vain.